Hi my name is Cindy and I live in Syracuse, Indiana. I recently got interested in ghost photography. I thought I would only come up wiyh some orbs or something like that but, I ended up with alot more. I quickly learned that my exspensive camera would only pick up orbs and my cheap camera for 15 dollars that has no flash would pick up these apparations. 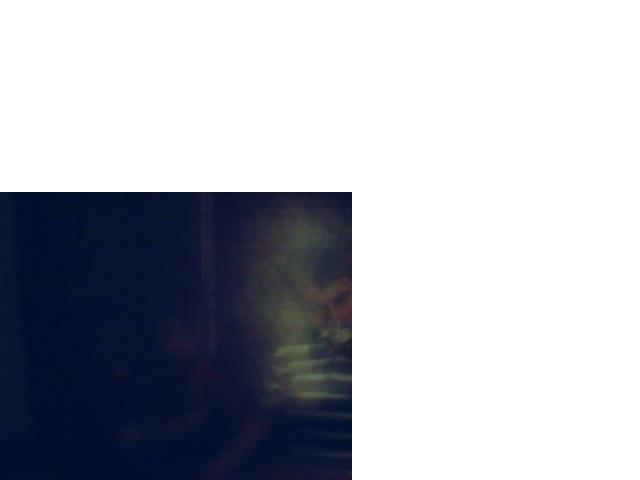 I take lots of photos in my home and get apparations everytime. This is weird to me especially since I look online and I don't see anyone who gets photos like I do. Perhaps it is because of the type of camera they think they need to use. Now the first photo I sent you is infront of my computer where most of the apparations occur. There is always a bright yellow glow with people in them. 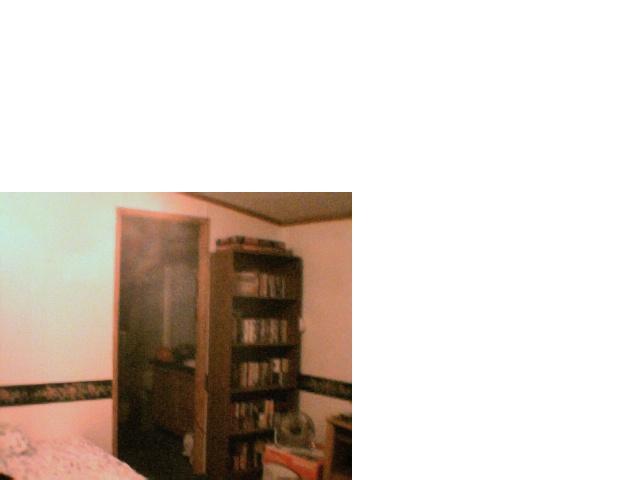 In this one there is a skeleton type figure and some one sitting in the chair in front of the desk. Then if you go to the left over to the chair against the wall at the bottom there is a head of a man with a cop hat or some sort of military hat. He is looking to the right. 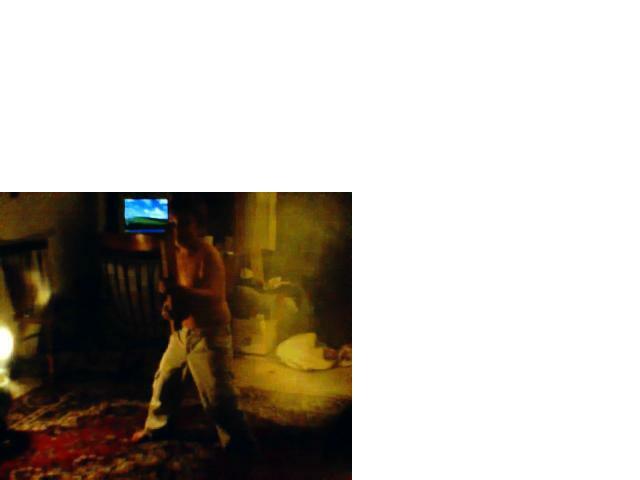 On the second picture I sent you thre is a little boy on my sons shoulder he is wesring a cowboy hat. You can't miss it. The third picture is of a night when i had my nieces and nephews over to spend the night. They was playing and trashing the house but we had fun anyway! Anyways there is a man or something that is black to the left of the picture sitting on the floor indian style. 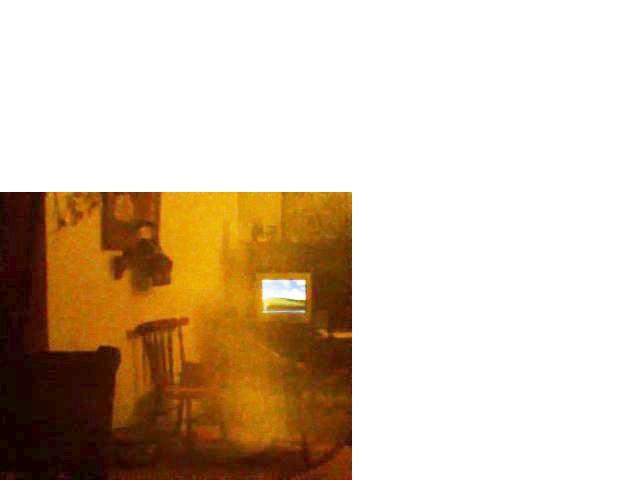 Then theres that bright yellow glow again and you can make people out in it and notice the black mist surrounding my son. The next picture is how it looks when i do not brighten the picture. I have to do that to some when there is not much light as it doesn't have a flash. ( yes it is a digital). 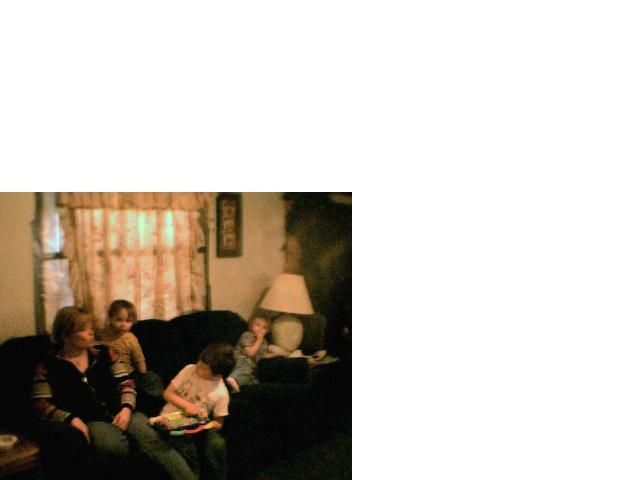 The next picture was taken at my sisters house soon after my brothers death. You will see a man in the door way. We strongly believe this is my brother. Either that or he has a twin on the other side. He died suddenly this past year of heart disease. He was only 33. The last picture I sent you is of me and a couple of my nephews at a birthday party. There is a black animal like creature wrapped around my neck. It looks like some kind of evil cat. It is staring me right in the face as I talk with my nephews. Also notice the apparation above the lamp to the right of the couch. If you post this picture I would appreciate if you would somehow blurr my nephews faces as I have no idea how to edit a thing. Well except how to lighten them up. These pictures are real and I just want to share my knowledge of life after death with anyone who wants to see or hear. I believe there a spirits everywhere and all you have to do is open your mind to new things and it will come to you. Thank you for your time in checking my stuff out and possibly posting them. I really like looking at your gallery by the way!